I think I finally finished my last Biggest Loser round. Yesterday was final weigh-in and I did not place or win... But I feel like I got what I needed from the group, finally. I've been participating in these groups off and on for two years (can't believe it's been that long!). In the beginning it started off (for me) purely as competition. I was motivated by the idea of winning, and I actually did place third in the first round. I've participated 5 or 6 times since then (I lost count) and haven't placed. I always lose weight and get so much support and encouragement, which is the whole point so that's wonderful. But I think I might be finished. I still intend to participate in a group for support/encouragement, because that is always helpful, but the competition part of it, for me, I think is over. I used to think that to hold myself accountable for what I eat and how much I exercise, I needed to weigh-in once a week. I do think that having some measurable way to keep track of progress is essential, not only to have accountability, but also to give you a boost of confidence and pride when you're feeling like you're getting nowhere. I think I will start measuring in other ways. When I started out (again) in January, I had it in my mind that I wanted to lose 100 lbs by September. A lot of people looked at me like I was nuts... 1) because most didn't think I had a hundred to lose and 2) because that's a lot of weight to lose in not a lot of time. I still have that number in the back of my mind, and I'm sure it would be so nice to reach that goal by Sept (when we are supposed to go on our trip to Dominican Republic). 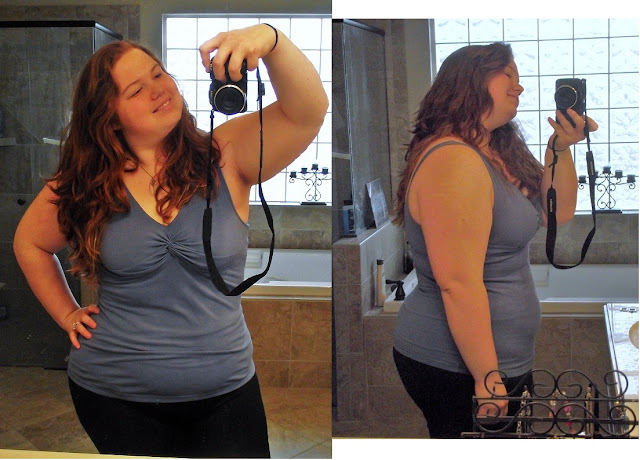 But I think now instead of "reaching 100 lbs lost", I want to try to find another goal to reach. I think that one is attainable, but I'm realizing more and more that the achievements I reach off the scale are so much more valuable to me, and what I think, ultimately, will be more sustainable. I have gone to the gym 4-6 times per week for the past 8 weeks. I drink 6-9 bottles of water per day. No more fast food, though we do eat out and I have a "fun meal" usually once per week. I no longer crave Diet DP, though I have one occasionally just to remind myself how little I want it and how bloated it makes me feel. I'm looking damn good in my clothes (at least, that's what Husband tells me). My flexibility is improving as I stretch at the gym. I can jog for 5 minutes straight (though I still feel like death, which hopefully I won't very soon). My mile has improved from 15:15 to 13:45 in the past 3 weeks. The weights when I lift increase every day. I attend 2 classes at the gym and at least 2 personal training sessions each week. Our lunches are prepared and frozen over the weekend, so I have no excuse during the week. Braylen & I have dinner together at work before the gym every night. I "only" lost 18.5 lbs this round in Biggest Loser, whereas the first round I lost 30.2. But, given the above list... I refuse to feel poorly about that. I refuse to give in to self-doubt & self-deprecation and sabotage all the progress I've made. My body is healthier than it was 8 weeks ago. My mentality towards food & exercise is healthier than it was 8 weeks ago. 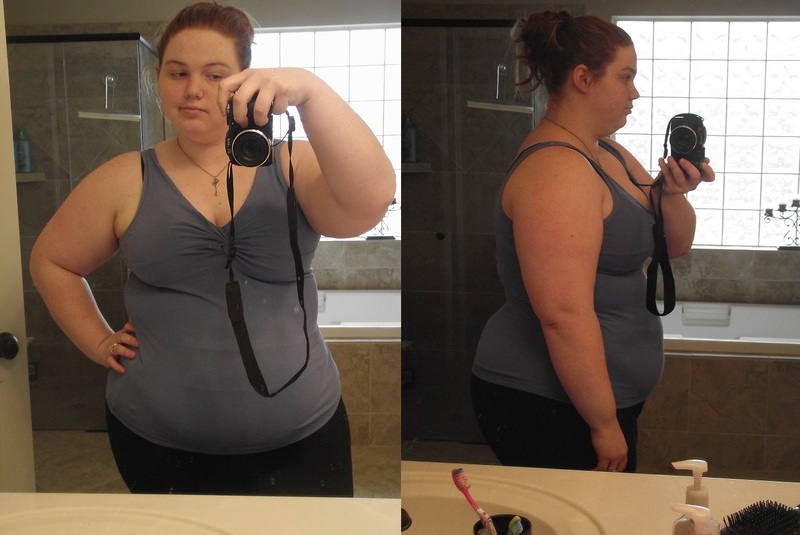 So, regardless of what the scale says or that I placed 10th in a weight loss competition... I am doing this. I am the person I want to be. It's already happened. Not 100 lbs from now... Right now. This is the person I hoped to become. I am not the healthiest I could be because of the choices of made in the past and how much extra fat I still have to lose. But I've crossed the wall that's been holding me back all this time.